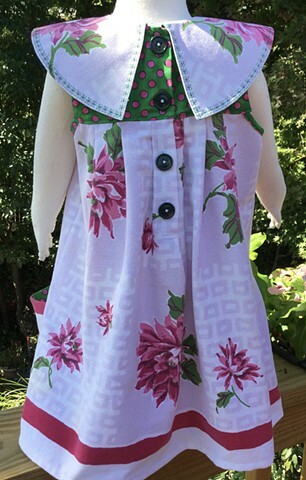 Upcycled tablecloth with pink dahlias and subtle squares in the background is paired up with green and pink polka dots to become a lively fun dress, size K-1st Grade (5-6 years). The only fit is armpit to armpit (27”), so it could fit up to a 7 year old. Pleated skirt attached to yoke with big round collar, big green buttons close the back, giant square pockets showing the dotted lining. As always, one of a kind, 100% cotton, washable, $60, made by the designer herself and shipped free to any address in the U.S.